• Bad breath, or halitosis, can be caused by eating certain foods, improper oral hygiene, or as a symptom of another health condition. • Tooth decay occurs as plaque and bacteria eat away at the tooth enamel and down into the dentin. • Periodontal gum disease results when plaque and bacteria get under the gum line and damage the gums and supportive tooth structures. • Sensitive teeth occur when some of the protective covering of the tooth wears away or when part of the tooth root is exposed. 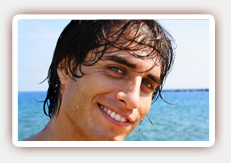 • Crooked teeth can be corrected through orthodontic tooth-straightening treatments. • Toothaches are a symptom of another oral health problem and are a sign to see the dentist. • Broken teeth can occur from improper use or injury. Some may be repaired, while others will need replaced. • Enamel erosion can be caused by certain foods and beverages or by brushing too hard. This may lead to sensitive teeth, chipping, cracking, and decay. • Mouth sores may go away on their own or may require treatment. • Overbite and underbite typically require orthodontic treatment. 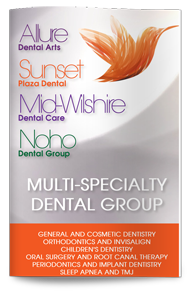 If you have dental problems, make an appointment to see our dentist in West Hollywood. After a comprehensive exam, the dentist will provide you with recommendations and treatment options to improve your oral health and to increase the attractiveness of your smile.